Xauth Cookie authorization is based on MIT-MAGIC-COOKIE-1 (also known as magic cookie method), in which the UNIX program Xauth views and transfers cookies. The X-server obtains the cookie, which is a 16-byte random number. When the X-application connects, it sends the cookie. If the 16 bytes sent by the application are the same as the bytes in the X-server, the client is authorized. The Xauth cookie is a file named Xauthority that is stored in your home directory. This file is a password for the X-Win display – do not assign that file group or world read or write permissions. The correct permissions for this file are read and write, only for the local user (you). Allows remote clients to connect based on the host name or IP address. Add hosts to the allowed host list. Only hosts on the list will be authorized to connect. 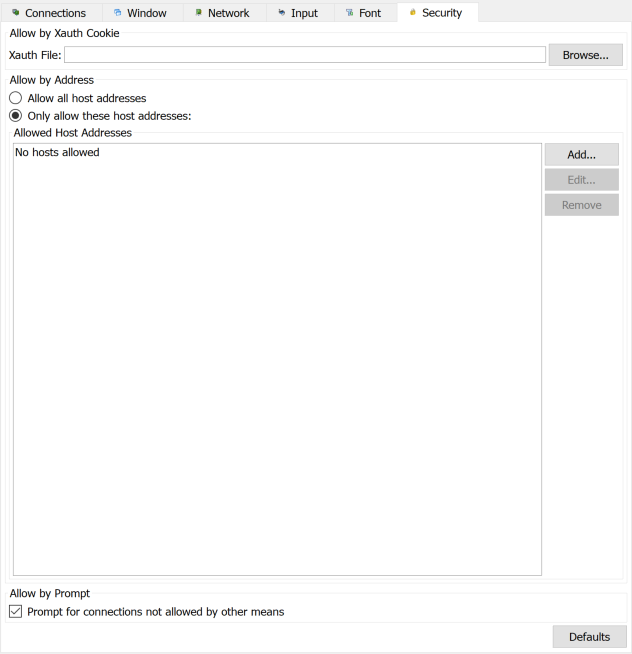 When a client is not authorized via Xauth, Address, or SSH with X11 forwarding, a request will occur with each connection attempt – allow or deny that connection.